This is sort of the way I feel about Howard's Old Fashioned Picallilli when I forget to get some before departing New England for Iowa. Once you've left New England, you simply cannot get any. I discovered, however, that they DO mail the stuff. It's expensive, but worth it when there is no other way. Amazing what I will eat it with! Strange I never heard of Howard's Picallilli, being from that general area. I looked it up on-line; looks tasty. the might be able to get just what you want! Can't you just buy the loose stuff and fiddle with it? This is great! I have similar thoughts when it comes to hot dogs. 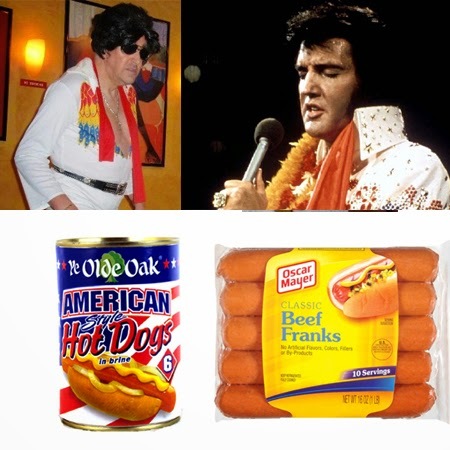 I didn't know that they sold them in a can here, but I've had fat sausages that claim to be hot dogs and they are most assuredly not. There are few things I miss from the US, but a barbecued hot dog in July, surely there must be a constitutional codicil that assures me of that right as an American citizen. 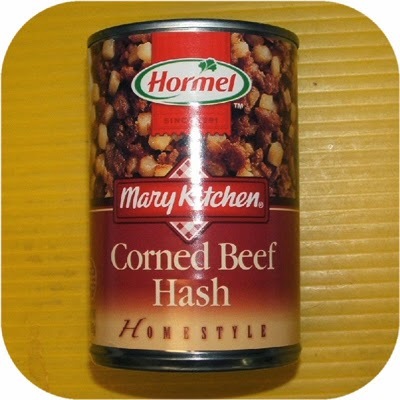 I'm sure that tinned corned beef hash is nicer than it looks... not! 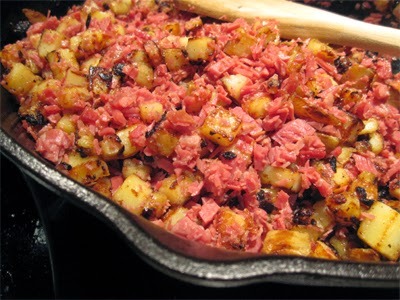 My version is dead easy - boil potatoes and mash them, or cut them up roughly if you prefer, chop corned beef into bits, mix together as thoroughly or not as you fancy, grate a load of cheese on top, bake in oven. We like it better than the fried version with the lumps. Even better if you have a bit of leftover cheese sauce to spread on top before the grated cheese. There you go, even you could do that, Mike! I didn't know you could get corned beef that doesn't come in tins until I went to some place in Philadelphia where they make their own. It tasted the same but saltier. I wonder what it's actually made of and if it contains any actual beef? And if so, how does it get to be so pink?! 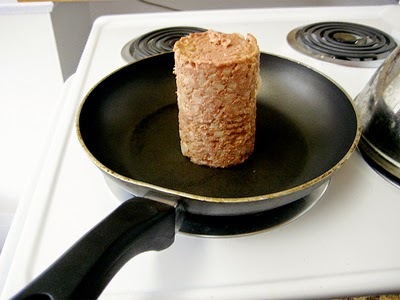 I've seen tins of corned beef hash in my local pound shop (though I didn't try it), and according to the Tesco website, they sell both tinned and frozen varieties. 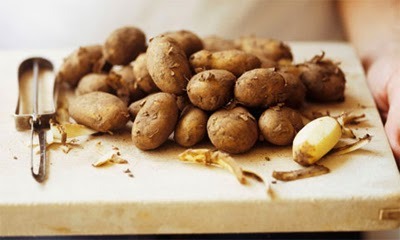 The spuds, by the way, are called Jersey Royals. This is apparently a registered trademark, so if the ones you bought were Royal Jerseys, then they must have been fakes. I think it was more a case of me being confused. I even did a modicum of research on Jersey Royals (tm) and still managed to call them Royal Jerseys in the post. Thanks for noticing; I will fix it. 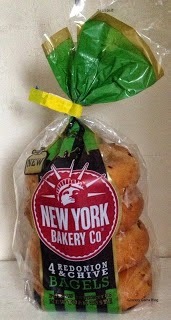 But now that you have alerted me to the lucrative counterfeit potato racket, I have to wonder what we actually did buy.